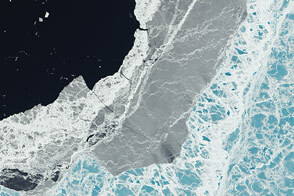 Along the Bellingshausen Sea coast of West Antarctica, ice has been retreating inland or being lost to the sea. Scientists knew this, but they lacked a full picture of the scale. 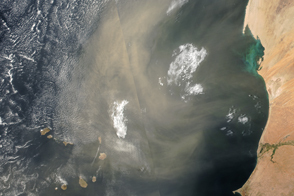 Now a team of researchers has compiled a Landsat-based data set and found that such losses have been going on for at least the past four decades and along the vast majority of this coast. 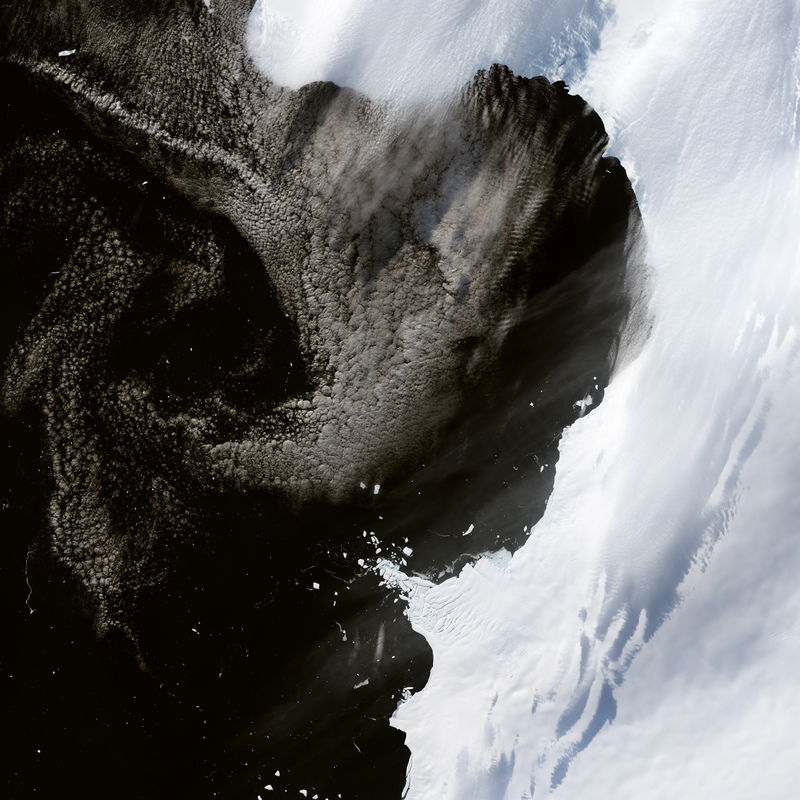 The Bellingshausen Sea—named for the Russian Admiral who found the continent in 1820—lies to the west of the Antarctic Peninsula. Examining Landsat data collected between 1975 and 2015, the researchers mapped the approximate locations of “grounding lines” in the ice along the Bellingshausen coast. These lines mark the intersection where glacial ice flowing from the continent is connected, or grounded, to the seafloor. 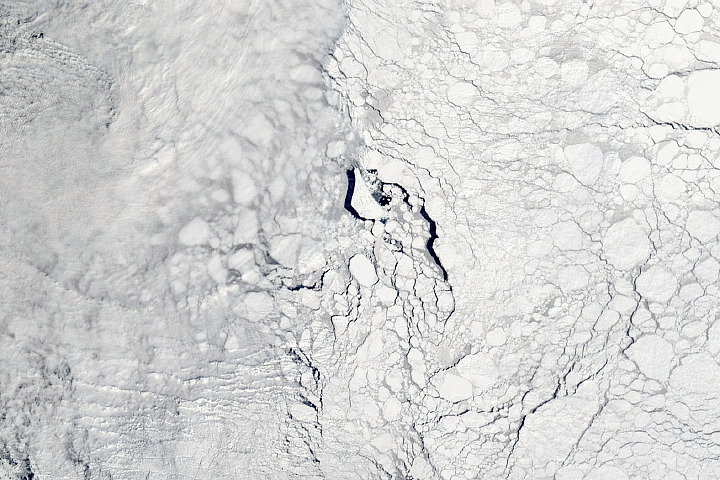 Any ice past the grounding line usually floats on the sea as an ice shelf. When ice is lost to the sea, the grounding line retreats. Meanwhile, the ice loss contributes to global sea level rise. Christie and colleagues used Landsat data to locate “inflection points” on the surface of the ice that indicate the approximate location of grounding lines below. An inflection point—which can be tricky to detect by an untrained eye—is defined as the last location where the slope of the ice dramatically changes before flattening out into an ice shelf or meeting the sea. The team combined its Landsat projections of inflection points with radar data from the European Space Agency’s ERS 1 and 2 and CryoSat-2 satellites. 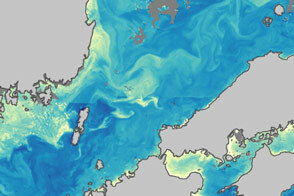 They found that the majority of the coastline along the Bellinghausen Sea experienced some grounding line retreat over the past four decades. The findings were published in Geophysical Research Letters. 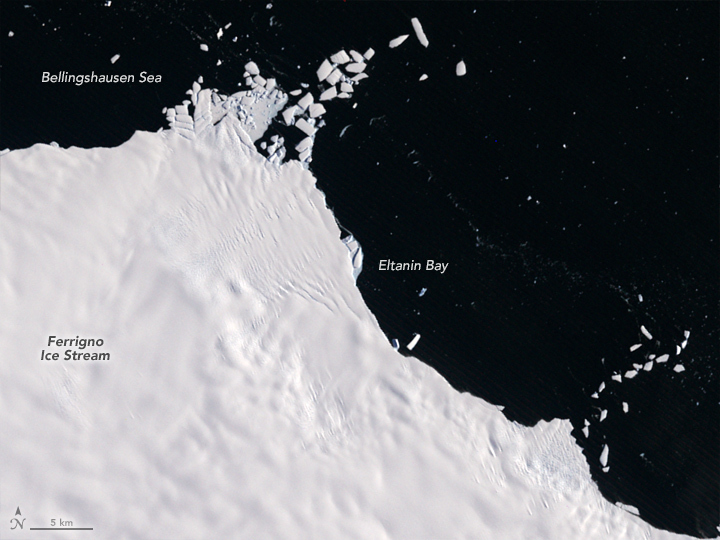 The images above show an area near Eltanin Bay, where the majority of the grounding line is found at the seaward front of the ice. The top image was acquired by the Multispectral Scanner on Landsat 2 on February 18, 1975; the second image was acquired by the Operational Land Imager on Landsat 8 on March 2, 2015. Turn on the image comparison tool to see the scale of the retreat in this area. 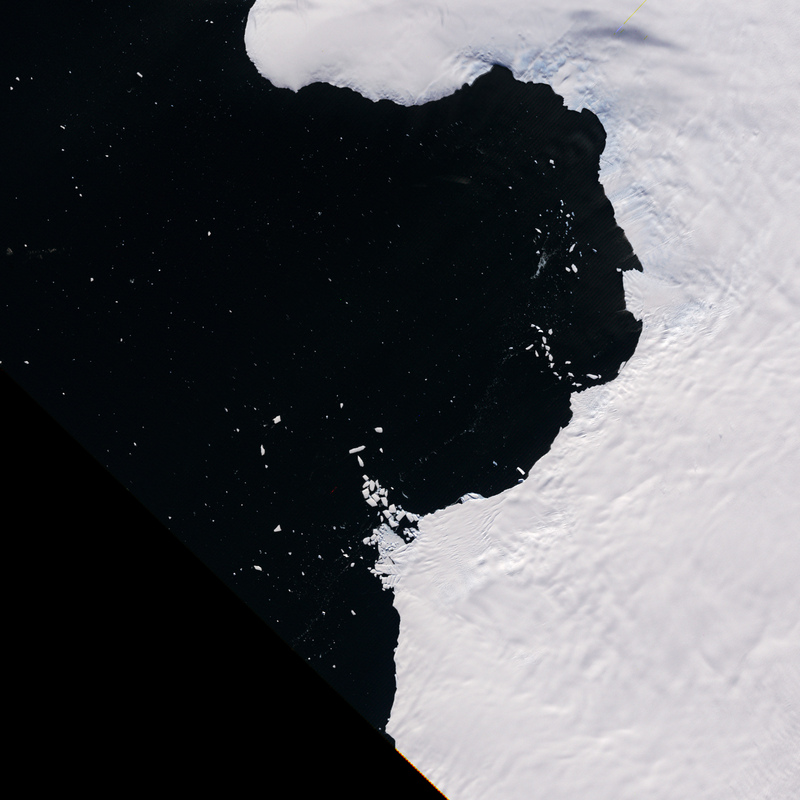 The ice loss is most pronounced along the Ferrigno Ice Stream, which was named for Jane Ferrigno, a U.S. Geological Survey scientist who used satellite data (including Landsat) to map Antarctica. NASA Earth Observatory images by Jesse Allen, using Landsat data from the U.S. Geological Survey. Caption by Laura Rocchio, Landsat Communication and Public Engagement Team. 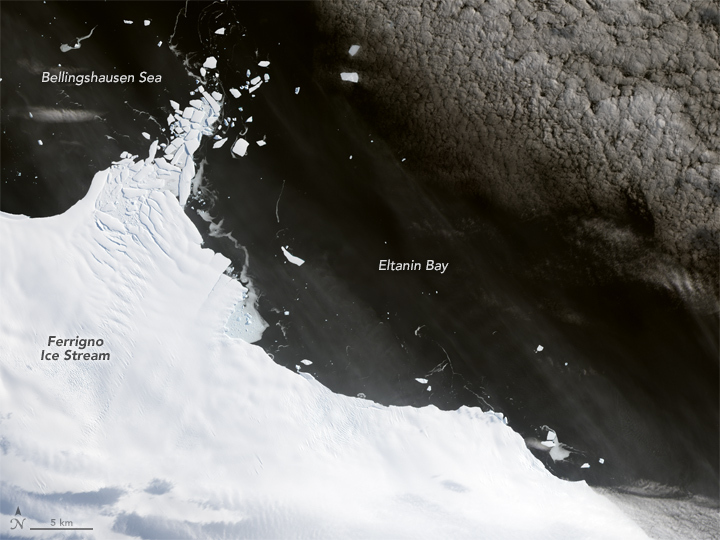 Over the past four decades, the ice along nearly two-thirds of the Bellingshausen Sea coast of West Antarctica either retreated inland or has been lost, contributing to sea level rise. Christie, F.D.W., et al. (2016) Four-decade record of pervasive grounding line retreat along the Belingshausen margin of West Antarctica. Geophysical Research Letters, 43. 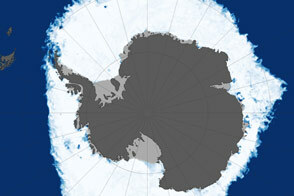 University of Edinburgh (2016, June 1) Antarctic Images Reveal Decades of Ice Loss. Accessed June 21, 2016. British Antarctic Survey and U.S. Geological Survey (2016) Antarctica Overview Map. Accessed June 21, 2016.